Feeling a little weak in the knees? If you are suffering from knee pain - we hear you!! Knee pain is the most common lower limb complaint experienced by Australians. The unstable nature of the knee joint makes it highly susceptible to acute injury, like on the sports field or if you fall, trip or step awkwardly. The significant weight bearing role the joint plays also makes it a joint that tends to suffer from wear and tear and degeneration (arthritis) over time. Whether it be knee pain due to acute injury, or knee pain that has slowly crept up on you, it can be very disabling and keep you from doing the activities that you enjoy including walking, running, playing sport and even going to the movies (believe it or not, there is an arthritic condition called “Movie Goers” knee which makes it uncomfortable to sit with your knee bent for the duration of a movie!!). Knee pain can affect your day-to-day activities like walking up a set of stairs and squatting to pick something up from the floor. At Aushealth Physiotherapy we treat patients with knee pain on a daily basis and we get great results. Our Physiotherapists are highly trained in assessment of knee pain and we know, as with any musculoskeletal injury, a correct diagnosis is essential to effective management. Based on our findings and your goals, we develop an individualised treatment plan for you focused on restoration of normal range of movement, strengthening and decreasing the risk of exacerbation of your pain. We are able to refer for X-rays and MRI’s for further information when necessary. We also liaise with Knee Specialists regularly and we know when it is important to refer on for an Orthopedic review. Studies have shown that whatever the cause of the knee pain, strengthening and keeping the knee moving safely is integral to recovery. Remember, it is very easy for an acute knee injury to turn into a chronic knee injury with different symptoms if the original injury isn’t treated correctly. So don’t wait for your knee pain to go away on its own, have it treated properly by one of our experienced Physiotherapists. Call 9905 0048 for an appointment today and get confidence back in your knees. 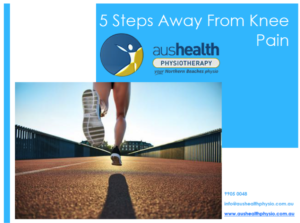 If you'd like some additional information to find out the best way for your to help your knee pain, click here to download our free guide "5 Steps Away From Knee Pain", you'll love it!